Reader Comment Of The Day: Shots On Franklin? Thought I heard gunshots last night (sunday morning) around 3:30am from my place just off Franklin on Milton.Â Sounded like a fight and at least 4 shots…Â anyone else hear this? As it would happen I bumped into (who I presume to be) the owner of Shayz Lounge. He was so sweet I wanted to pick him up and keep him in my pocket. But I digress. 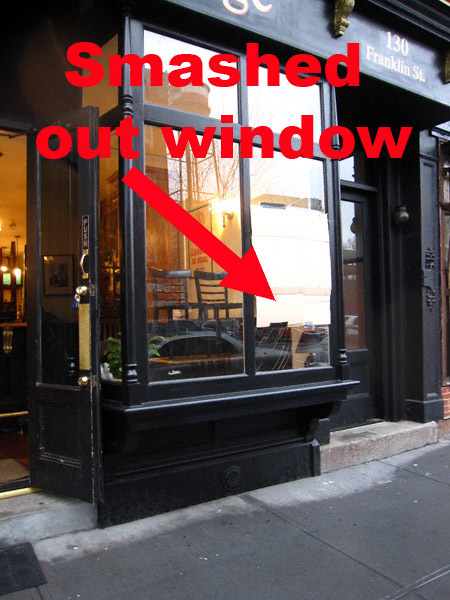 Upon noticing a rather substantial hole in the front window of his business I asked him what happened. He told me that at around 3:00 o’clock this morning a couple (who were NOT patrons of his establishment) got into a verbal altercation in front of his establishment. Not having mastered the art of Anger Management this gentlemen decided to voice his displeasure to his mate by smashing his fist through a window. THIS window. In addition I was told a number of people on Milton Street have reported having their car windows smashed in lately. 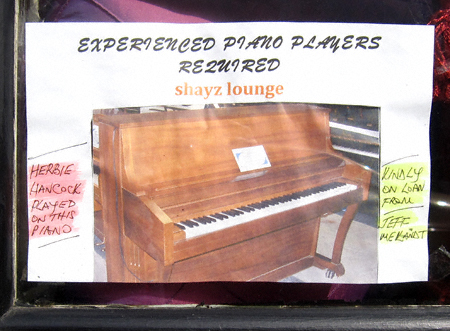 Aren’t you happy, fellow Greenpointers, our neighborhood is attracting such a fine caliber of citizen? I suspect I speak for many when I say I hope this jerk broke every bone in his damned fist. 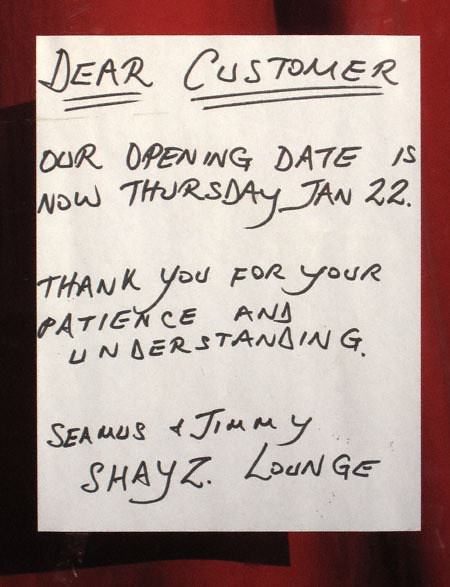 After a slight delay Jimmy and Seamus (whose name it is an absolute delight to type) are set to open Shayz Lounge tomorrow, January 22. I don’t know about you but I for one am very eager to see what (if anything) they have done to the place. As predicted Jack O’Neill’s has changed hands and as of last Saturday it has closed its doors. 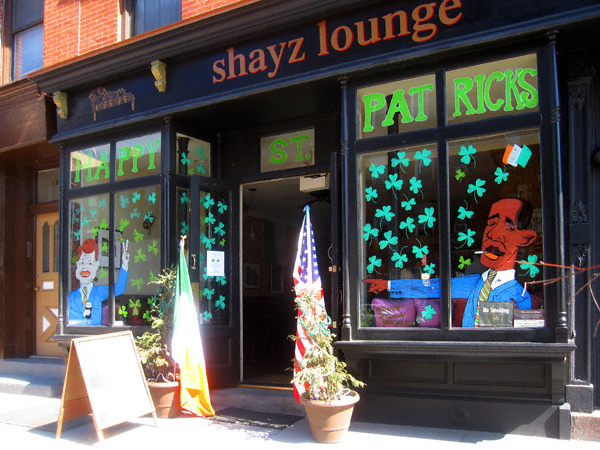 You can check out its newest incarnation January 17th when it reopens as the Shayz Lounge. I suspect I speak for many when I say I hope the new owners are going to keep the Irish pub theme and not attempt to transform this establishment into something unduly “hip”. Given the name they have selected I am not terribly optimistic, but I suppose we all will just have to wait and see. P.S. 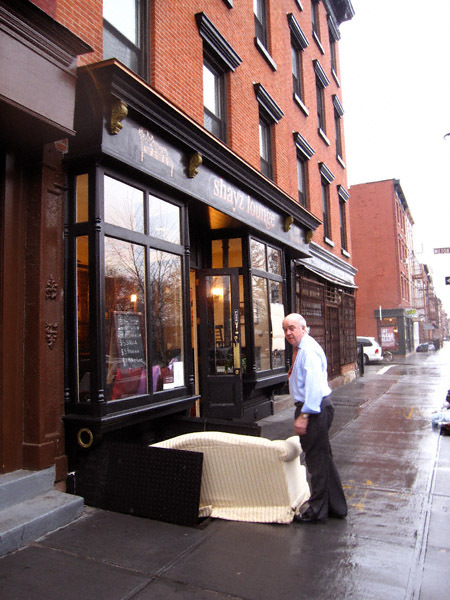 : Speaking of “hip” those would-be entrepreneurs among you who happen to have some a lot of extra change laying around might be interested to know 259 Banker Street has officially hit the market.